I picked this up with some reluctance. It’s been a busy year already. I have written one book which was completed in February, spent much of March researching my own new major series, and also working on a couple of other ideas in between giving talks. When this book arrived, I was keener on getting stuck into a Michael Connelly that appeared over Christmas. However, when a review copy arrives, I am duty bound to give it a go, so I picked this up late one evening and started reading. It was intriguing. The main character, Tiffany Mullan, was a young woman going on a date. She was to meet her man at a cocktail bar, but he met her outside, and suggested an alternative venue. All above board, all good, until she realises that the Uber driver called her man “Sam”, and he’d told her his name was “Tobes”. I once had a dinner with some editors and agents once, and while chatting about crime stories, one editor sighed and, to general acclaim, proposed that the worst books always started with a pretty, or beautiful, blonde who dies in the first few pages. Well, Tiff wasn’t blonde necessarily, but she was “amazing”, “pretty”, and turned many heads. So that evening, tired already, I put the book down and resolved to attack it next day with a clear head. Easter got in the way, so I didn’t get a chance to pick it up again until Monday, when I was at least fully rested. I picked it up. I tried to read it walking the dogs and failed (no - because it was raining); as soon as I got home again, I sat down with the book and a cup of tea (Earl Grey, if you must know, the Richardson’s version). And there I stayed for the day, basically. The lead character in the book is Solomon Mullan, Tiff’s brother. He has appalling injuries from an acid attack when he was in his very early twenties, two years ago. The attack was intended for his older brother, Luke, who was involved in some dubious criminal ventures. Both brothers feel responsible for their sister, because they are all orphaned. Sol also has a group of friends, the ‘Brain Pool’. They are a group of fairly dysfunctional, intelligent folks who work together setting questions for a TV show. Pedants, each with their own speciality, they meet in a pub once every few days - apart from Sol. He communicates with them via computer, but always with his camera turned off. He can see others, but he keeps himself concealed behind a spinning question mark as his avatar. He has hardly left his home in two years, since the attack. When his sister is attacked and left to drown in the canal, Luke and Sol are at a loss. Tiff is alive, but the hospital is keeping her in a coma to give her time to recover. No one knows how long for, nor how badly she has been injured. While worrying about her, Luke is also concerned about a deal going sour with a crime boss, and Sol is terrified of leaving his home and moving amongst real people, who will, he knows, react badly to his appalling injuries. But both brothers want to know what has happened to Tiff. When Sol mentions the attack to the ‘Brain Pool’, he begins to hear about other attacks on young women. This is not a single assault, this is one of a series, he realises. This is definitely a thriller, rather than what I would call a straight crime story. To me a crime story of the conventional sort will introduce several characters, each of which could have a strong motive for the crime, and the guilt will gradually be exposed. In my own personal definition of a thriller, although the plot can be convoluted and clever, the plot uses less of the characterisation of the leading suspects. In Perfect Match, the perpetrator is held back from the reader. However, don’t think of this as a failing. The writing is taut, clever, and very sharp. I personally loved the depiction of the areas of London, where it’s based, because I could recognise them all. And yes, it’s not my definition of a crime story as such, but that is not a criticism. I found this book impossible to put down. I spent the whole of Bank Holiday Monday reading it, and when I was finished, I was exhausted. At one point, there is mention of a boy sitting on a roller-coaster, rattling and squeaking as it is hauled up the first incline, the rising tension, the slow approach to the peak, and then the swoop and dive as it plunged down … well, that analogy came to me as I was cantering through the last few pages. Yes, it’s a rattling good story. 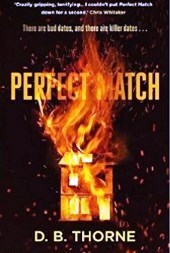 Brilliant plotline, utterly convincing characters - whether criminal or police - and the sort of writing that glues your eyes to the pages absorbing the words with a kind of desperation as you approach a deeply satisfying denouement.